If there is one area of the security industry that shows how the industry has advanced technologically, it would arguably be the area of facial recognition. Far from the days when a photograph or even a printout of a face could fool a reader into verifying an identity, today’s facial recognition systems have advanced significantly. To be sure, of the many facial recognition solutions on the market, there are many that are still poor identity authentication mechanisms and should be avoided in professional settings. Yet the leading providers have taken the discipline of facial recognition to new heights of fast and accurate recognition, along with the ability to do 3D scanning and more in order to detect if someone is trying to fool the system with a picture or a mask. Facial recognition also makes many people nervous. China will be rolling out an insanely broad facial recognition system over a number of years that will be able to recognise people wherever they may be, which naturally also leads to privacy and security concerns. We’ll see similar projects in the Middle East soon as well, along with projects that aren’t spoken as much of in First World countries. Getting back to the access and identity market, Hi-Tech Security Solutions asked a couple of companies driving the development of this technology for their input into what is happening in the facial recognition arena, as well as some of the touchy issues this technology is bound to highlight. The issue of faking facial identity is very relevant today. While we happily leave our fingerprint everywhere we go, the fact that our face is ‘out there’ and caught on multiple cameras every day seems not to bother us. What are modern facial biometric readers doing to avoid being tricked with fake faces or to ensure the face they verifying is actually alive? Walter Rautenbach, MD of neaMetrics, says there are several different technologies out there ranging from 3D imaging, facial thermogram, facial vein, infrared depth analysis, image analysis and machine learning based classifiers. Some of these technologies, like 3D imaging, require expensive hardware, making it unfeasible for practical use, and conventional algorithm-based methods using 2D images, which up to now have not been accurate, require exhaustive calculations/computing power. ViRDI SA’s Deon Janse van Rensburg, adds that many companies are using dual extraction i.e. colour and infrared cameras to extract facial features. This helps with the normal challenges such as light conditions, facial changes, weight gain/loss etc. A few companies are using 3D extraction technology, although this has very high processing requirements which are not always ideal for access control applications. If one looks at CCTV for instance, the facial recognition systems require full blown XEON-based servers. This is obviously an issue for access control since the object of using biometrics is speed with security, and server based authentication is not optimal. With so many options to choose from, and with the knowledge that the more accurate methods of recognition require significant processing power, the question arises as to whether facial recognition is at a level where it can be used for identity authentication as easily and reliably as, for example, a fingerprint? Alternatively, is it at a level where it could be used as part of a multimodal biometric solution? Our two interviewees differ on this question. Janse van Rensburg says no. “Although facial recognition has come a long way in the last few years, the Equal Error Rate (EER) is nowhere close to where fingerprint biometrics are. There are simply too many false positives to be as reliable as fingerprint systems. Rautenbach, on the other hand, is more positive. “Facial recognition techniques have dramatically improved. I have some personal doubts about Apple’s claims of facial being 50 times more unique than fingerprints. If these claims are true then one can only hope this technology finds its way to the general market outside of their silo. “In the meantime, we believe that facial identification is an effective means for databases sized between 3000 and 30 000, depending on the type of technology implemented. The accuracy and confidence in facial identification accuracy can be seen in the Suprema stable where database sizes for access control terminals increased by 300% over the past few years. When it comes to multiple forms of biometrics or identification being used at the same time to improves security, it seems pertinent to look at another ‘future’ technology that may fit perfectly with facial recognition – behavioural biometrics. Behavioural biometrics is both new and old. Humans have been making conscious and unconscious decisions using it since we appeared on earth. We get a ‘gut feeling’ about someone, or we think they are acting suspiciously – something control room operators should be trained to spot. Today, behavioural biometrics has become something computers are being programmed to do to assist in video analytics, for example. The idea is that instead of verifying an identity at the start of a transaction, such as logging into a computer or entering a premises, the machines will be able to identify a person by their regular behaviour or habits. This has proved an accurate way of identification when looking at the way people type, for example – after typing a few words, it is possible to accurately identify the typist. Behavioural biometrics will supposedly be a way in which we can continually verify an identity, ensuring that the person typing on a computer is who they claim, for example. Similar options exist for analysing the way people walk, talk and a host of other behaviours. When we take the potential of facial recognition, being able to identify people walking down the street or approaching a boarding gate at an airport, etc., and add behavioural characteristics to that, the opportunities for constant identification are enormous – and rather terrifying. Of course, as noted, facial recognition is its own form of continuous verification if one can rely on the various cameras used in monitoring operations. Rautenbach says facial biometrics is ideal for continuous authentication and logical authentication. “There are several providers of such solutions and I have personally been using FastAccess from SensibleVision since 2010 – and I was not an early adopter. He notes that another behavioural biometric that is receiving headlines is wearable heart rate monitors, be it dedicated or standard gear. It is being advertised as a more secure and effective way to control authentication. Janse van Rensburg says we’re dipping our toes into the murky waters of artificial intelligence here. “Certainly facial recognition systems can be used in behavioural biometric solutions since the face is the easiest way of determining behaviour. Law enforcement have been using the technique for decades (if not longer) and although there is no scientific basis for something like physiognomy [the facial features held to show qualities of mind or character by their configuration or expression, according to Merriam-Webster] it is acknowledged that facial expressions etc. can indicate behaviour. “The issue here is that humans are intelligent beings that can ‘sense’ nuance, and should facial recognition be used as a behavioural biometric, what intelligence should the device possess to be able to use facial as a behavioural metric? Another question would be, how far are we from having a fully autonomous AI that can perform such a function? Google has experimented with AI and recently had to delete one of their AI programs due to the fact that it quickly ‘learned’ biased racial attitudes towards certain Google users. As for facial recognition being used as a secure logical authentication mechanism, he again says the jury is still out on that. “For many years a freeware program called KeyLemon has been available that allows PC users to unlock their PCs by using the webcam and the results haven’t been stellar. Nevertheless, ViRDI is not slacking when it comes to advancing its facial recognition solutions. Its AC7000 is a multimodal biometric device that uses 3D geometry with isometric facial recognition, fingerprint recognition, dual proximity card reader and a keypad all based on the Android architecture. Suprema is now on its second generation facial recognition terminal. Rautenbach says FaceStation 2, launched earlier this year, includes a more advanced algorithm, performs 3000 identifications in less than a second and overcomes the influence of ­external light with operation possible in conditions up to 25 000 lux. Suprema’s Live Face Detection technology combines cutting-edge technology with advanced proprietary algorithms. A dual camera system captures both visible and IR images which are then processed using advanced image analysis techniques and intelligent machine learning based classifiers. A fake face is detected by estimating specific features and their distribution compared with reference models of real faces. “In the enterprise identity solution division as well as the BioRugged mobile biometric terminals, we use an array of specialised facial ICAO and facial identification libraries. In most of these solutions, facial technology is used as part of multimodal configurations as well as performing 1:1 matching against provided ID document images. Facial identification is also extremely popular for user authentication and monitoring if a user’s session should remain active or not. The traditional use of facial for visual verification on ID cards also remains prominent where humans do the biometric matching and therefore the importance of ICAO standards remain key to ensure quality portrait capture. Capturing ICAO standard portraits uses the same type of techniques internally as facial identification, to measure facial dimensions, proportions, positioning and gestures to ensure compliance. When considering the implications of facial biometrics alone, and even more so when including behavioural biometrics, the question of privacy naturally becomes more important. However, he says that a clear differentiation needs to be made between dedicated facial recognition devices, which include special hardware to perform strong identification, and facial recognition performed on video data. The latter is not as accurate, but definitely easier to collect, process and mine. 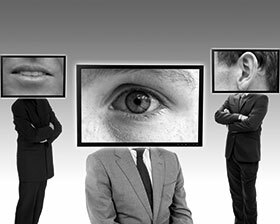 Fortunately for the victims of such pervasive surveillance, organisations that collect video data, including or excluding facial recognition, will have to comply with regulations such as PoPI and will have to show that the data is used for the purpose advertised and only accessed by those authorised to use the data for that purpose. Taking a more philosophical view, Janse van Rensburg says, “biometrics, and specifically facial recognition biometrics certainly touches on one of the more sensitive moral and ethical conundrums of our time. With the advancement in technology in the last 60 odd years, we are faced with a mixture of the worst portions of ‘1984’ and ‘Atlas Shrugged’ as governments and the private sector have intruded more and more into our lives. “The question we have to ask is, what is better for the greater good? We as humans have never experienced the levels of terror we are currently experiencing. Terrorism is highly organised, highly funded and can strike anywhere at any time. If the terror of the 1980s taught us one thing, it is that certain individuals need monitoring, but where to draw the line? Who gets monitored and who doesn’t? “China is busy with a multi-decade project where every citizen will have his or her biometric data on a database – including their faces – and they can be monitored and identified at any time in any location that has a CCTV camera. Is this the type of society we want to live in? Terrorism may not allow us the luxury of such philosophical questions.